As the weather gets colder, it’s important to make sure your home is winter ready. Here are a few simple tips on how to prevent exterior winter damage from Jack Rende, senior merchant of building materials at the Home Depot Canada. Inspect your roof. Then, apply roof repair glue to any loose shingles in order to help avoid leaks or damage in your home. Choose durable, weather-proof shingles. 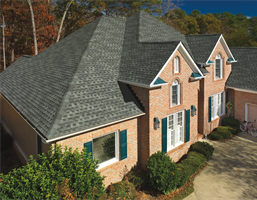 GAF Timberline High-Definition shingles can withstand category three hurricane-force winds of up to 246 kilometres an hour. Install roof-heating cables. This will cut down on snow or ice buildup, saving your home from expensive long-term damage. Before installing, make sure your eavestroughs and roof have been well cleaned. Then, attach roof cable clips to your roof in a zigzag pattern. Finally, secure your heating cable to the clips. Prep eavestroughs and downspouts. Seal any cracks with a silicone sealant and install a filter to prevent leaves from clogging. Reapply exterior caulking. It’s important to do so in any gaps between your siding and window or door frames. Turn off exterior faucets. Be sure to drain water from outdoor pipes, valves and sprinkler heads to prevent pipe bursts. If your home is 10 years or older, consider installing frost-proof faucets.